A summary of today’s show: Marianne Luthin shared the breadth of the Pro-Life Office’s work, including Project Rachel retreats for post-abortion women; the Archdiocesan Pregnancy Help Center, which provides counseling and assistance for women in crisis pregnancies; and Respect Life Education, which creates curricula and trains teachers for school-age children and sponsors chastity speakers. Fr. Mark O’Connell and Scot Landry also previewed this coming Sunday’s Mass readings on the Transfiguration of Jesus. 1st segment: Fr. Mark reflects on his week: worked on 16 marriages cases, said Masses in four different places. 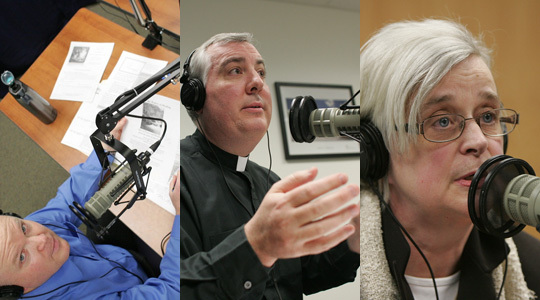 Scot said that he met today with priests who work in the Central Region of the Archdiocese to talk about the work he’s doing in Catholic Media. He found them very receptive to what they’re doing in media. The Church is very active in pro-life efforts. The March for Life is one activity, as well as the Way of the Cross for Life on Good Friday. Many priests, deacons, seminarians, religious and laity all participate. But there is much more, which Marianne Luthin will share after the break. 2nd segment: Scot and Fr. Mark welcome Marianne Luthin. Project Rachel retreat is coming up on March 26. It is an outreach ministry across the US and the world designed to offer hope and healing and reconciliation to women and men who’ve participated in past abortions. It takes its name from Rachel in the Old Testament, and in the Holy Land there is a shrine to her where women come to pray for safe childbirth. It recalls Jeremiah 31:15-17 where Rachel weeps inconsolably and the Lord comes to her to tell her to cease her cries of mourning, there is hope for the future. Marianne knows many women cry tears of desolation for years and it is the mercy of God that can heal those tears. There are countless millions of women who suffer the effects of abortion. There are 1.2 million abortions in the US every year and with every abortion there is both a father and a mother, and sometimes their parents and medical workers and friends and family who participate. It is estimated that nearly 1 in 3 women of childbearing age in the US have had abortions and Catholics abort at about the same rate as non-Catholics. Fr. Mark asked if the women on these retreats are those who have recently had abortions or if it’s those for whom it’s been a long time. Marianne said that they often find its women coming to them after years living with abortion. She had one woman who was in her 90s who’d had an abortion 69 years ago. The most common reaction of a woman having an abortion is a sense of relief right after it happens. But it’s after that fact, maybe after getting pregnant again or on the anniversary of the abortion, that all these issues come to the fore. Scot asked whether she encounters many women who believe incorrectly that they can’t be forgiven for the abortions. There are probably many who do who never call or contact her office. She estimated that close to 80 percent of the women who call them say something like, I understand God forgives, but I can’t forgive myself. Many woman go to confession after confession, but can’t experience the healing love of Christ. On the “Healing Waters” retreats, they begin by helping them understand it’s a totally confidential process. They don’t even list the location of the retreat publicly. They also ask the participants not to repeat any stories they hear and that raises the comfort level of the women attending. Ideally, no more than 10 women are on any retreat because the team needs to be able to offer each woman exactly what she needs to experience the healing love of Christ. Fr. Mark asked how common it is for men to come forward to ask for help. Marianne said it is very rare. The schedule of the day includes Scripture reading; personal witness; a social worker who speaks to the women; a Penance service; quiet time for personal prayer; Eucharistic adoration; information about monthly support groups; and ends with Mass. Scot said he’s seen the information about the retreats primarily in bulletins. How would Marianne recommend people spread the news about it to women who’ve had an abortion? She said that it is very tricky and the person would have to know the woman very well; that each situation is different. This is why the bulletin ads are so important, because they offer a confidential, low pressure means of spreading the word. But someone could also say something like, “I’ve heard about Project Rachel, they have retreats, a website, and there’s a video on the website.” There’s also a section on the website of testimonies of women who’ve been through Project Rachel and the difference its made in their lives. Those 30-40 women represent a cross-section of every kind of woman. Every woman will find something to match her experience. Other retreats will be May 21 and June 25, all on Saturdays, 9am-5pm. The phone number is 508.651.3100. If someone wants to support Project Rachel financially, they can write a check made out to “Project Rachel” and send it to the Pro-Life Office, 5 Wilson Street, Natick, MA 01760. 3rd segment: There was an article in the Pilot last week about the new ultrasound machine that is just part of what the Pregnancy Help Center of the Archdiocese does. The center was founded by lay volunteers in 1973. The Archdiocese took it over as a full-time ministry in 1985. They offer services in 3 languages. They have two trained nurses who offer help in English, Spanish, and Portuguese. Women struggling to make a decision about abortion can find counseling, information, and now an ultrasound. Ultrasound can make a tremendous difference, particularly with this new machine because you can see the baby’s heartbeat at 6-1/2 weeks, which is about when most women find out they’re pregnant. Having spoken to hundreds of women who’ve had abortions, she knows many women regret having made the decision to have an abortion too quickly. They never had the time to reflect on the full-range of what they were doing. Fr. Mark said the ultrasound sounds wonderful, but it may sound scary to some people. Marianne said it’s the women herself who makes the decision to have an ultrasound. The ultrasound is housed at the ob-gyn offices at St. Elizabeth Medical Center. So when a woman comes to the Pregnancy Help center, she meets with a counselor first to talk about where she is in her pregnancy and what her concerns might be. The ultrasound enables her to understand more fully where she is in her pregnancy. Often when she sees a picture of her child, she forms a bond with him. Ironically, in an abortion the abortionists use an ultrasound, but won’t let the mother see it. Not every woman needs or wants an ultrasound. Some women have already made the decision not to have an abortion, but now have been abandoned by others in their lives or need a lot of help to continue. The Pregnancy Help center is not just about telling women not to have an abortion, but provides positive assistance right through the time of birth, even up to several years after. Each counselor develops a personal relationship with each client and knows what she needs: financial assistance, housing assistance, referrals to services, help with employment issues, assistance with maternity and newborn needs. Marianne said that thanks to parishes in the Archdiocese, they are able to offer the practical assistance to these women in need. Fr. Mark asked about lack of insurance, and Marianne said the women are signed up on the spot. 4th segment: A lot of the material goods used in the pregnancy help centers are gathered by parish-based baby shower programs. The program was founded by one woman 26 years ago at Holy Ghost Parish in Whitman who wanted a way to participate in a pro-life work and so she invited friends to bring an item for an expectant mother and it grew from there to become the pregnancy help parish baby shower program. Many parishes will set up a place in the back of the church for people to drop off items for expectant mothers and children. There are practical ways for everyone to help. Fr. Mark encouraged parishioners in parishes where the baby showers aren’t held to talk to their pastor about setting one up. Marianne said groups like the Knights of Columbus and the Catholic Daughters of America are also active in providing assistance. Many young people are getting involved, engaging the whole parish and working to explain the program to others. Once you make that one-to-one human connection of providing a specific gift, like a child’s snowsuit, to a specific child, even if you don’t meet them yourself, it makes a lasting impact. Other ministries include the Spiritual Adoption program: take as an intention in your prayer life one particular mother and child and at the end of the 9 months hold a baby shower. March 25, the Feast of the Annunciation is a good time to begin because that it is when Christ came to us as an unborn child. Respect Life Education’s main program is the curricula for middle schools, including “Created for Love”, written specifically for parish-based religious education in the Archdiocese of Boston. They also sponsor talks by nationally known chastity speaker Jason Evert in the archdiocese. Lenten Pro-life retreat on April 16, 9am-2pm at the Daughters of St. Paul convent in Jamaica Plain. Everyone is encouraged to attend, including those who’ve been involved in pro-life ministries. They will have a reflection by Bl. John XXIII Seminary seminarian Edward Rama, who before seminary was very involved in pro-life ministry in his parish. 5th segment: To get the most out of Mass, we have to prepare. The more you put in to it, the more you get out of it. Each Friday, Scot and Fr. Mark will talk about the readings coming up for that Sunday’s Mass. First reading is from Genesis 12:1-4 and the Gospel is Matthew 17:1-9. The two readings are interrelated. This is the Transfiguration Gospel. There aren’t many times in the Gospel that we hear the voice of God the Father. He doesn’t just identify Jesus as His Son, but tells the disciples to listen to Him. Scot believes this is significant. How many times do we just hear the Scriptures, but not really listen to them and internalize them? Fr. Mark said the first reading and the Gospel build up to that line, “Listen to Him.” In the first reading, the covenant with Abram has three promises. The great nation is fulfilled in Moses, with the exodus from Egypt; the great name is fulfilled in David, who became the kingdom, and the great blessing is in Jesus, ultimately in the cross, but starting with the Transfiguration of Jesus. Scot also noted that the disciples were afraid, but Jesus tells them, “Do not be afraid.” He also asked Fr. Mark what we should make of Jesus telling them not to tell anyone about the vision. Fr. Mark said he thinks it’s too much for them to understand in the context, that this is a glimpse of Jesus’ glorification, but that the fullness of glorification would come in the cross and that people could not understand the full extent of glorification except in light of the cross and Resurrection. Lent is a calling to us to change, to be transfigured. Nice message about Christ.Go ahead!!! !